Do you want to workout from home. Or simply just work fitness into your daily life without too much hassle or strain. Perhaps you want to fit a workout in at work? 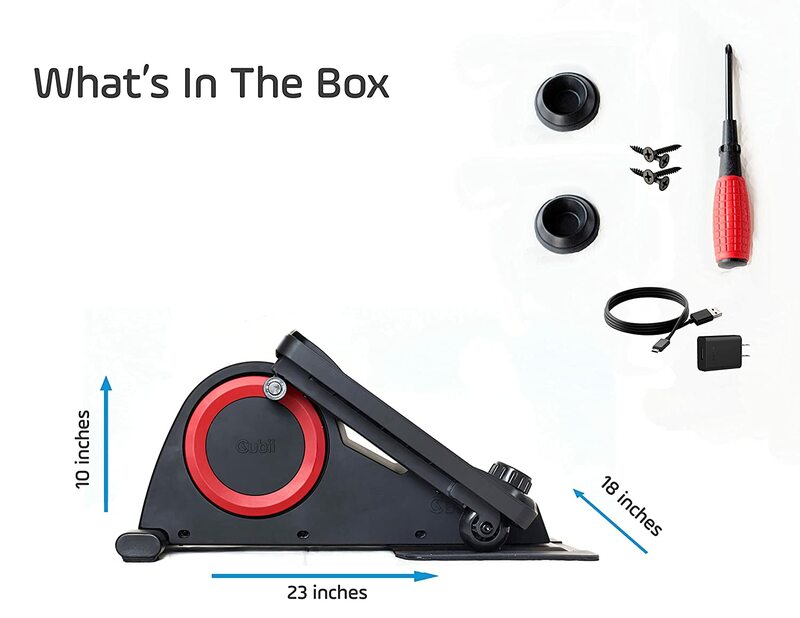 With Cubii Pro Under Desk Elliptical, you can do just that! The ONLY bluetooth enabled elliptical on the market. Super easy, all you do is connect the Cubii iOS or Android app and away you go! You can track your calories, strides, miles, minutes and RPM. Set personal goals and even compete against others. You can also connect it to your Fitbit. The Cubii lets you workout anywhere, but don’t be fooled by its size. The elliptical can improve your posture, engage your core and abs, hip flexors, glutes, quads, hamstrings and calves. This is a great alternative to anybody who wants to avoid the gym. Workout sitting in from of the TV. Or workout at work. Whatever you choose, the Cubii is for you! 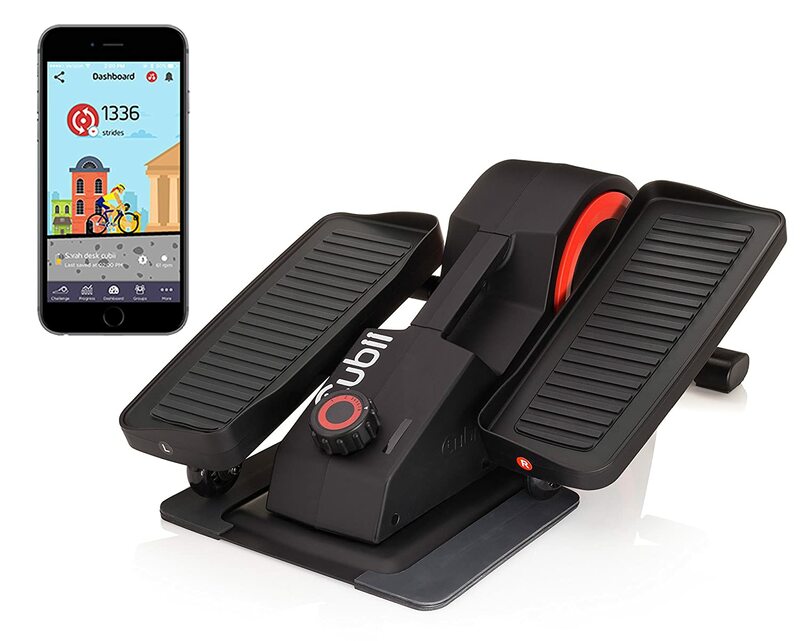 The Cubii has 8 different resistance levels, allowing you to adjust the intensity of your workout. Cubii have created this machine so anybody can incorporate exercise into their lives. Now you don’t have to go to the gym and you can workout inferno of the TV if you like. Their patented ergonomic design makes it easy to exercise while completing other tasks. Now you can incorporate your workouts into your daily lives easily and with minimal fuss. Cubii allows you to connect to its mobile app to track your calories, distance, strides, time and RPM. Stay motivated to keep exercising. Set yourself goals and track how many calories you have burnt. You can even connect it to your Fitbit to track the amount of steps you’ve done! Cubii pro was designed to be comfortable to use. Massive amounts of R&D has gone into create an elliptical that is smooth and feels natural to pedal. Cubii Pro has been designed for people who sit down a lot during the day. We all know that sitting down for long periods of time day after day isn’t really good for you, So Cubi designed an elliptical for people that sit a lot. Because of it’s ergonomic elliptical design, Cubii Pro results in a low impact exercise that’s easy for your knees and good for your posture. Cubii understood that people want to workout at work. But the problem is, you don’t want to start doing burgess in the middle of the office. It just doesn’t feel appropriate! On the other hand, you cannot just bring in a stationary bike or elliptical to work. That’s why Cubii created something small enough to fit under your desk. But they also made sure it was quiet enough to not disturb anyone. 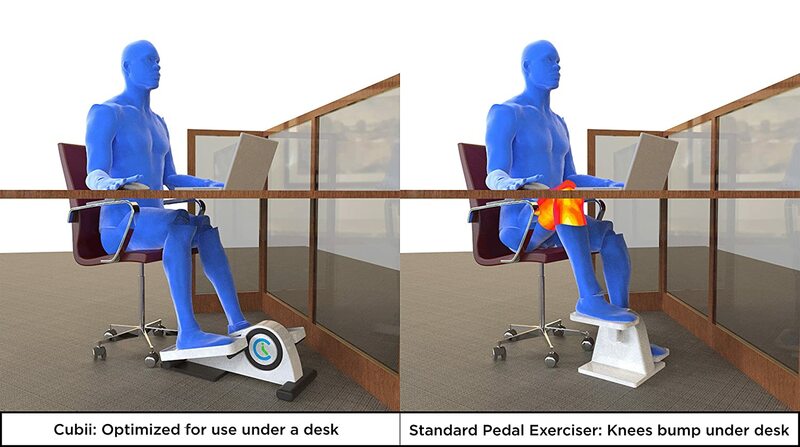 You can use Cubii Pro in an office without drawing attention to the fact you’re exercising. They have designed the machine in a way to make sure you don’t bump your knees on the desk above you. It’s ergonomic design makes sure you have a smooth workout every time. Obviously all desks are not the same. So Cubii recommends you have at least 2-3 inches between your knees and desk to ensure you don’t bump your knees. VERY QUIET – Designed specifically to be very quiet. You can workout in secret at work or sit in from of the TV without disturbing anyone. DURABLE AND STURDY – Cubii Pro is built to last! Yes, its not the cheapest under desk elliptical, but it’s most likely the best. It has better materials, better construction and more quality control too! The size and weight make sure it doesn’t slip while in use. DESIGNED FOR COMFORT- Patented ergonomic design provide a smooth workout every time that is low impact on your joints. Its compact design lets you easily use Cubii Pro under your desk without bumping your knees. EASY ASSEMBLY – When bought, it is very easy to assemble. 4 screws and your done. Estimated assembly time is 3-5 minutes. They’ve also included 2 wheel stopper to stop your office chair from wheeling away too!